After the rejection the Versailles treaty Germany signed the Anglo-German Naval Agreement, allowing Germany 51000 tons of heavy cruisers. These were splitted between 3 cruisers (Admiral Hipper, Blücher [sunk 1940] and Prinz Eugen) to be armed with 203mm guns in 4 twin turrets and 2 (Seydlitz [failed aircraft carrier refit] and Lützow [sold to Russia before completion in 1939] ) with 150mm guns in 4 triple turrets. The first batch (Admiral Hipper and Blücher) was 202 m long, 21,3m beam and 7,7m draft, displacing 18200 tons, while the second batch (Prinz Eugen, Seydlitz and Lützow) was 215m long, 21,8m beam, 7,2m draft and had 18400 tons displacement. The engines produced 132000 shp and enabled speeds up to 32 knots (Second batch had 136000 shp and 33,5 knots top speed). 6x2x105mm DP guns formed the secondary battery. Short range AA was composed of 12x37mm and 8x20mm. Later 4 37mm guns were removed and 20 20mm guns were added. In late 1944 the remaining 3,7cm SK C/33 guns were replaced by 14x40mm Bofors. 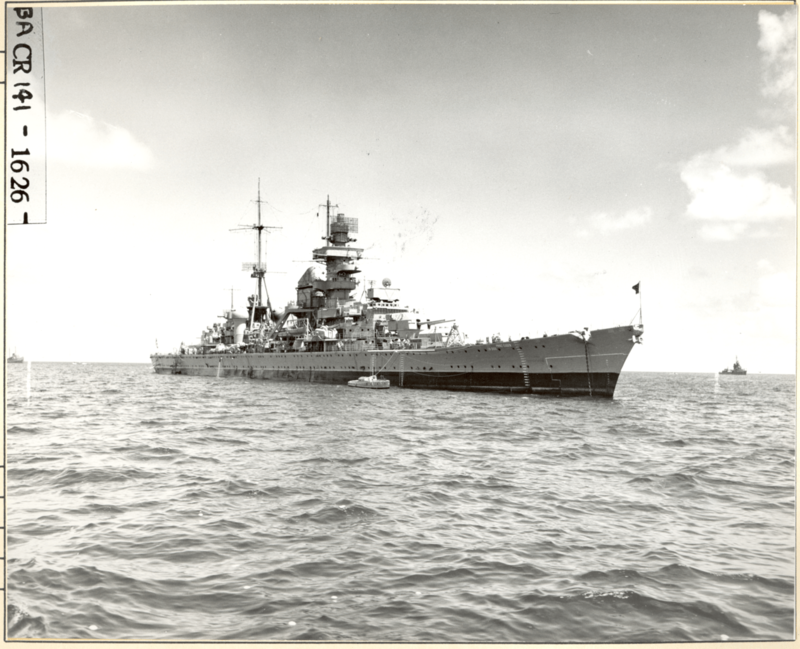 In 1945 only the Admiral Hipper and Prinz Eugen were still operational. 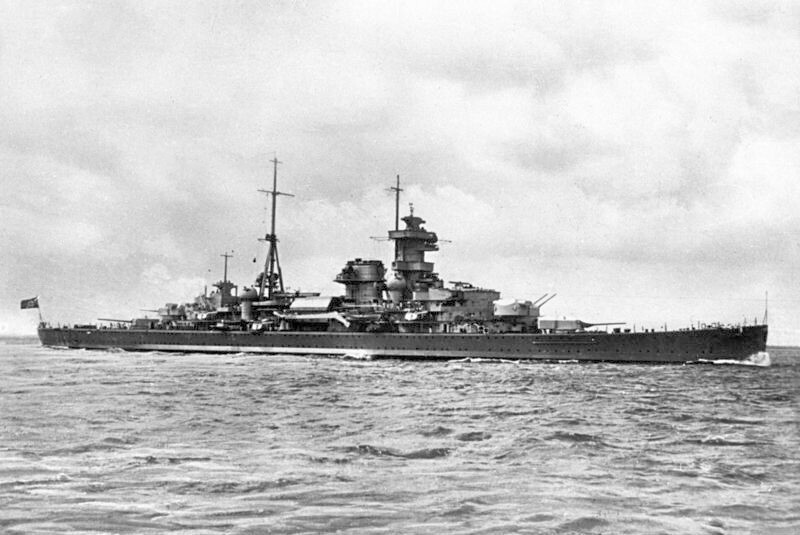 Prinz Eugen had 20x40mm Flak28 (German name for the Bofors) and 18 20mm guns while Admiral Hipper had 16x40mm and 14x20mm. Additionally this class carried 4x3x533 torpedo tubes. The armored belt had a thickness between 70 and 80mm. The class had 2 armored decks, one 12-30mm and the main one 20-50mm thick. The conning tower was protected by 50-150mm and the turrets by 70-105mm of Wotan armor. Solid cruisers. Mobile, and with good guns and advanced fire control (better than the allied one, but optical and therefore not good at night fighting) you can expect accurate guns and a solid platform where said firepower is mounted on, but not a tank. The torpedos are the standard German G7a (40 knots speed, 8 km range, expect speed buffed to around 55 knots) so nothing to get excited about. The firing arc should be better than on the Japanese cruisers. The German are lacking possible ships suitable for T7. 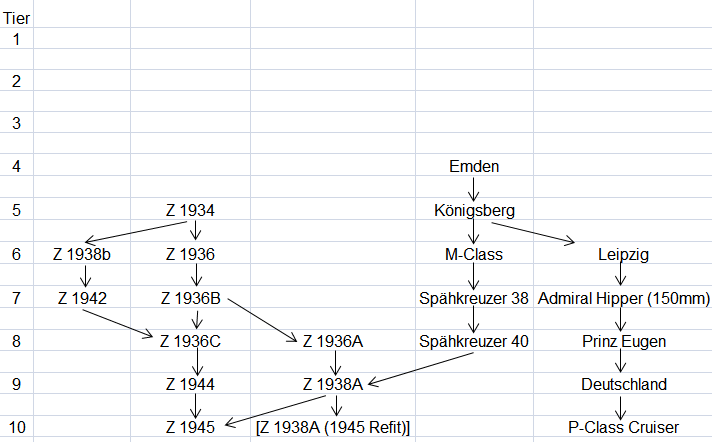 I checked WGs preliminary German tree and they either over-tier ships compared to the current tech trees or make stuff up. I can find no info on the “Super Eugen” for example. Therefore I would recommend making the 150mm armed version a T7. 12x150mm is nearly equal to the Mogami (soon T8 so making the 150mm Hipper T7 seems reasonable). The standard Hipper makes a good T8. However, the Prinz Eugen is a little better, but not better enough to justify making her T9. So therefore I would recommend using the Prinz Eugen as the T8 and making the Blüchner (first batch ship sunk in 1940) a premium. It would lack the upgraded AA and is therefore be a little worse, making it a good T8 premium. Now here things get complicated. These ships were initially classified Armored ships (Panzerschiff), the British referred to them as pocket battleships and the Germans reclassified them as heavy cruisers in 1940. Now to the ship itself. Since the Versailles treaty allowed the construction of a replacement for the aged armored ships (battleships with less than 10000 tons displacement) in 1922 first thoughts about this were made. Several designs were considered basically either strong armor but low speed or higher speed and weaker armor. In the end it was decided to go with later idea in 1929. A 182m long hull with 20,6m-21,6m beam, displacing 14500 tons (10000 officially) was fitted with two triple 280mm (11 inch) guns (2.5 rpm) and 8 15cm guns in single mounts. Two quadruple torpedo tubes were mounted at the stern. Initially AA consisted of 3x1x88mm guns from the first world war. Between 1938 and 1940 these were replaced by newer 105 mm Flak (DP) in dual turrets. Additionally 4x37mm Flak and 10x20mm guns. The AA was constantly improved up to 6x40mm Bofors, 8x37mm and 33 20 mm Flak. Armor was on the level of the Admiral Hipper class and the Deutschland-class was capable of 28,3 knots. In early 1945 the remaining 2 ships were providing ground support fire at the Eastern front which both the Germans and Russians deemed effective. According to one source the Russians were shelled so hard they thought the Germans were using a new Wunderwaffe or the V1 flying bombs. An improved version of the Deutschland-class, part of the Z-Plan. Bigger, faster, better protected. 230m long, 26m beam and nearly 26000 tons displacement. The same main battery kept it’s calibre and layout but was supposed to receive a newer version of the guns with a longer barrel used on the Scharnhorst class with a reload speed of 17 seconds. (other sources say that no changes were planned). Speed was calculated with 33-35 knots. The armored deck was thickened to 100 mm, the belt to 120mm. As torpedo armament 6 submerged tubes were considered. The 15 cm Secondary batteries were reduced to 2 dual turrets above the 11 inch guns. 4x105mm, and 4x37mm were the planned air defense. If WG would pull out a 1945 hull version this would work as a T10. Throw in some 30mm or 40mm AA, or even 55mm Gerät 58 you could make this a formidable opponent for everyone. The DPM would be weak (half a Des Moines) but your alpha damage and penetration would be stronger than any other cruiser. Think about all the sweet citadel penetrations against other cruisers. 600mm penetration should even do the trick against most battleships. This becomes more relevant when WG fixes the armor of some ships and when the AP nerf in 3.1 becomes active. Also you could play your range to your advantage. Expect at least average accuracy. It would certainly be an unique addition to the game and spice things up. Also you could tank some damage with your hp. Hope you like it. See you later!